This blog is my contribution to the debate about how much the 50p tax rate might have raised if it had ever got the chance, and how much in comparison the 45p tax rate could be expected to raise. And, of course, whether this has anything at all to do with the real reasons for tinkering with the top tax rates. The Office of Budget Responsibility's (OBR) estimates of the tax receipts from both the 50p and 45p tax rate are on p. 111 in their Economic Forecast (pdf). The table refers to "forestalling" about the 50p rate, and "reverse forestalling" about the 45p rate, and provides estimated figures for both. "Forestalling" means bringing forward income in anticipation of a future tax rise, and "reverse forestalling" is delaying income in anticipation of a future tax cut. Both the 50p and 45p rates were announced a year before their introduction. It is hardly surprising that people who are able to vary the times at which they receive income - typically, business owners receiving dividends from their businesses - will do so in order to reduce their tax bill. So it is not surprising that HMRC's figures (pdf, p.31) suggest that £16-18bn of income from high earners was brought forward into the 2009-10 tax year, which is after the 50p rate was announced but before it was introduced. And similarly, we would expect that following the announcement of the 45p rate to be introduced in April 2013, those who can will delay their income receipts until after that date in order to benefit from the lower rate. We can therefore confidently predict that in the tax year about to commence (2012-13) the 50p rate will raise stuff all, and in the following tax year (2013-14) the 45p rate will raise an AWFUL lot. Of course we won't have real figures for these until, respectively, 2014 and 2015, since self-assessment tax returns don't have to be submitted until the following January after the tax year end. Remind me when that General Election will be, again? 2015, is it? Well, what a coincidence. I have no doubt that the Conservative Party will be proclaiming the success of the 45p rate, and attacking Labour's "high tax policies", as part of their election strategy. But the forestalling effect is short-term. After all, you can only bring forward or defer so much income. What we really want to know is the long-term effect of these rates. And for that, we need to look at the OBR's original estimates and what it calls the "underlying impact" for the 50p rate, and its estimates for the 45p rate. For the 50p rate, the OBR's figures for 2010-11 show the tax only raising £0.7bn against the OBR's original estimate of £2.5bn, a difference of £1.8bn. Both those figures assume zero forestalling. There are of course no actual figures for 2011-12 yet, because tax returns for that year aren't due in for several months yet. However, the OBR has helpfully provided estimates out to 2015-6 for the expected tax take from the 50p rate, which show the take remaining very similar - £0.6 to £0.8bn per year - and therefore a continuing and growing shortfall against the original estimates, which assumed that the tax take would increase. The IFS, in its commentary (pdf, p.13) on the 50p tax rate, noted that the model used to create these estimates was imprecise and the figures should therefore be taken with large amounts of salt. Richard Murphy argues that these figures are ridiculously low, that no-one could possibly avoid that much tax and that the OBR must be deliberately producing low estimates at the behest of the Chancellor, to support his political agenda. I wouldn't put that past Gideon, myself - although claiming that tax can't be avoided to that extent doesn't exactly support Murphy's case for tax reform, either. But it's all academic now, anyway. We will never know exactly how much the 50p rate would have raised once forestalling effects had unwound, because it will be overtaken by reverse forestalling and other behavioural effects on the 45p rate. The closest we will ever get to the real amount will be in the figures for 2011-12 that should be produced early in 2013 - but even those will probably still include some forestalling effects, as the OBR's estimates suggest. Beyond that the waters become much murkier. Murphy claims that the figures for 2011-12 will prove that his estimate of £6.7 bn for the real tax take from the 50p rate (excluding forestalling) is right. But his calculation that the real figure for 2010-11 is actually £5.7bn is simply wrong (see comments on his blog), and personally I can't see how £0.7bn can turn into £6.7bn in one year. However, if the OBR figures are in any way reliable, they do indicate how easily high net worth individuals are able to avoid tax. 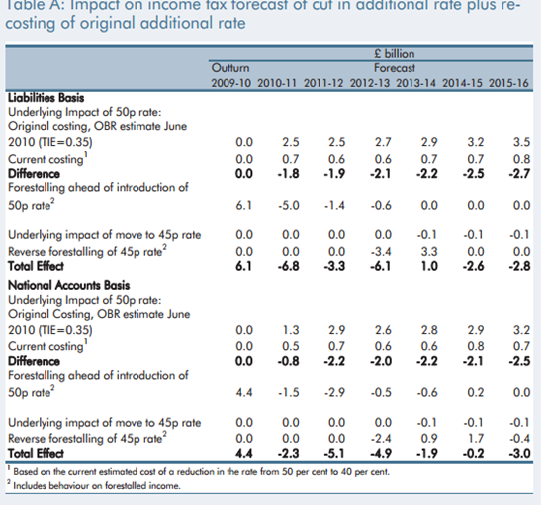 The 50p rate should have raised a lot more - as the OBR's original estimates suggest. That it apparently falls so far short of expectations even after allowing for forestalling indicates that people have also found other ways of reducing or hiding their income. Some of those will of course be completely legitimate - such as spending more time on the golf course, or emigrating. But many will be exploiting quirks in the tax system that enable income to be diverted or hidden in a way that reduces the UK tax liability. Rather than reducing the rate, the obvious thing to do is to reduce the avoidance, by closing loopholes and clamping down on the use of service companies and offshoring. Which is exactly what the government is proposing. But they are reducing the rate as well. I am slightly puzzled as to why they are doing this, because low though the estimates are for the 50p rate, they are at least positive. And why a cut of 5p? Why not eliminate the extra band completely? Mind you, on an income of £2m, a drop of 5p in your top rate of tax is a saving of considerably more than most people earn in a year, or for some people, in a lifetime - so what looks like a small cut, and therefore pointless, actually is much more significant both for the Treasury and for the individuals concerned. It looks to me like a massive political gamble: cut the top rate, in the hope of encouraging your high earners to stay in the UK and pay tax here, and hope that tax reforms will reduce avoidance enough to make up for any tax lost. Or, alternatively, clamp down on tax avoidance to try to increase your tax take, while cutting the top rate to encourage your high earners to remain in the UK even when they are stopped from reducing their tax bill through avoidance strategies. After all, these high earners contribute more tax than anyone else (see chart on p.15 of the HMRC link above). We really don't want them to leave. In fact amid all the arguments about Laffer effects, tax avoidance and tax take, few people seem to have noticed the most obvious reason why the Government has chosen to reduce the top tax rate to 45p rather than either retaining the 50p rate or scrapping it completely. The chart on p.26 of the HMRC document already cited shows that the 50p top rate was the highest statutory tax rate in the G20. Reducing the rate to 45p moves the UK to about halfway down the list, lower than its European competitors and comparable with China. Presumably the idea is that this reduction will reduce the incentive for UK top earners to move elsewhere (though they could still move to low-tax jurisdictions such as Switzerland, of course) while still maintaining a higher tax take than scrapping the band completely would give. So is this really about tax take? Or is it actually a move that supports the Government's stated aim to be an internationally competitive tax jurisdiction? Is it really a "gift to the rich", or is it a clumsy attempt to offset the effect of closing tax loopholes for the very rich, in the hopes of getting them to stay in the UK? I don't know. But to me the whole thing looks more political than financial. When is that General Election, again?? "A number of businesses reported that they deferred some bonuses that would normally have been paid in March 2013 to April 2013. Thus, total bonus payments received across the whole economy during the period May 2012 to April 2013 was £38.6 billion; an increase of 4% compared with a year earlier." No doubt this sharp increase in tax revenues will be claimed by the Conservatives as "evidence" that their tax cut raises more money than "Labour's 50p rate". But it is nothing of the kind. We will simply never know whether the 45p rate will raise more, or less, tax than the 50p rate would have done. Amid all the hot air about 50 -> 45p why is nobody mentioning the 62% marginal tax rate (still in place) for those earning between 100k and 112k? I would suggest that most SME owners are fall in this category ( i.e. over £100k but less than £150k) and are disproportionally affected by this rather than 50% over £150k. Typical that Gideon and the Tories favour big, international, business, with their corp and income tax reductions rather than home-grown SMEs. There's a simple explanation. There are fewer people in the £100-£150K bracket and they pay less tax overall than any other group - see the chart on p.15 of the HMRC pdf. I would therefore suggest that most SME owners actively avoid falling into the 62% marginal tax bracket. It really doesn't matter what the headline rate of income tax and NI is. Once you have hired an accountant he/she will do everything possible to reduce your liability by juggling dates, swapping income with dividends, opening offshore accounts, etc, etc. It becomes an annual ritual, a game, an intellectual challenge, 'us' versus 'them'. It will end when there is no direct taxation. Never! That graph always gives me pause. We know the 1% have increased income massively (and yes, I realise the 1% won't have been the same people every year), but that average incomes haven't. Given that one would expect the % contributed by the 1% to have increased, regardless of taxation policy (unless it went to flat rate rather than % of income). It doesn't show that the 1% are paying a larger % of their income in tax, it shows they are getting a larger % of the total income.